In our effort to illuminate the past, archaeologists must correlate different sources of evidence in the analysis of the cultural, social and economic dimensions of past human behaviour. This behaviour, however, is not solely composed of the interactions between humans themselves, but also between humans, animals and their environment: the questions of the effects domestication had on technology, the structuring of trade and the economics of the growing Empire, the effects of human behaviour over the landscape and the history of alimentation are just some of the possibilities open to inquiry as Archaeology turns to animal bones as sources. The course we offer aims to present the basic principles of this discipline to interested students without prior experience with this subject and, for the student already dealing with zooarchaeological research, the course offers the opportunity to practice laboratory work and gain experience with the identification of the Campanian fauna. 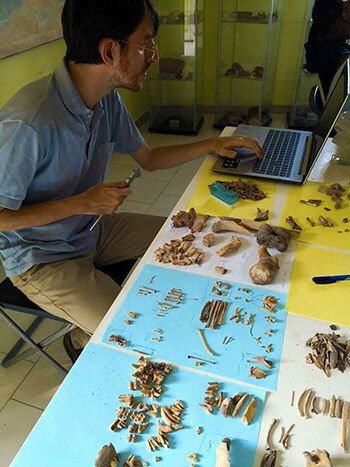 To accomplish this, our one week course will combine theory lectures and direct laboratory practice on newly excavated material, covering basic notions of anatomical identification, zoological taxonomy, familiarisation with the fauna of ancient Roman Campania and quantitative and qualitative analysis of bone data. Taphonomy will be discussed, both as a post-depositional phenomenon and as a consequence of human intervention, dealing with burn and cooking marks, different kinds of cut-marks, fragmentation and other physical traces on the bones. The basics of estimations of number of individuals, the consumable weight and the allometric variations will be discussed. Most importantly, we aim to connect these theoretical and practical facets of Zooarchaeology to the site of Pollena Trocchia, presenting what this specialisation can tell us about the bath complex and its connection with the villa, and how the animal assemblage can be linked with other kinds of evidence and be used to pose new questions about the relationship between our site and the others in Campania at the time of the later Vesuvian eruption. The Apolline Project aims to study the commercial connections between sites in Campania, the neighbouring regions, and the wider Mediterranean basin through all kinds of archaeological evidence. 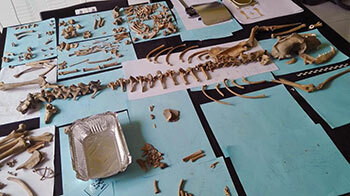 Within this frame, the animal remains are used to characterise the alimentary patterns in the later Roman Empire and the regional organisation and interconnection of food production. We argue that there is evidence proving that the production network operated both at regional and interregional levels and that the Pompeian eruption of Mount Vesuvius deeply affected the production and distribution routes. Zooarchaeology can indeed provide instances of the crisis periods and the subsequent transformations occurred in the economic networks. More specifically, we are interested in understanding whether the late antique food patterns differed from the known records of the early Imperial period (with an inversion of preference for sheep/goat over swine) and whether the environs of Vesuvius were supplied by local producers or through transhumant flocks from the neighbouring area of the Apennines. 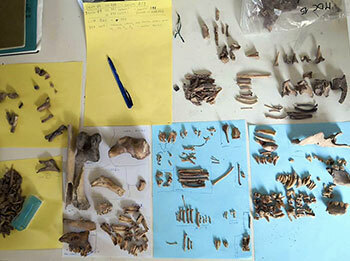 Lastly, on a smaller scale, the faunal evidence from Pollena Trocchia can help clarify the micro-history of the site, as for example by assessing whether each room was still in use or abandoned at a specific timeframe. This approach proved already extremely useful to specify theories, test the evidence from the artefacts, and open the research to new questions on the wider landscape. The class will take place from the 12th to the 16th of August 2019, at the cost of 350 EUR. To apply, please go to this page.